The baby girls who were born in 1950 are now grandmothers. They will turn 65 this year! It is safe to say, though, that a lot of their first names may not be getting passed down to their grand-daughters at the same rate that grandpa's name is probably being given to the boys. How many baby girls do you know with these names? Notice how 8 of the above names from 1950 have completely fallen off the Top 1000 chart in 2013! The names that still made the cut mostly rank in the lower half of the chart except for Elizabeth, Mary, Margaret, Karen and Cynthia. 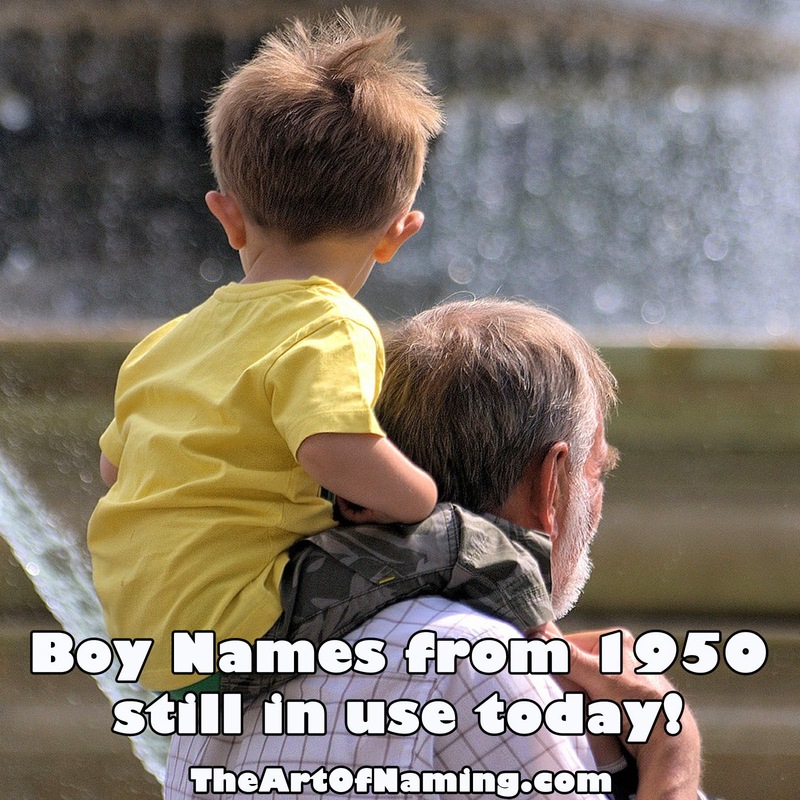 Compare that to the Top 25 boy names of 1950 and you'll see that all of the boy names still ranked above 600. Why is it so different for girls? Fashions seem to change faster for girls than they do for boys making many of these girl names feel somewhat "dated" as a result. Let's take a look at the rest of the Top 1000 from 1950 and see which of those may be back on the rise today. I went through the list and picked out one name per 100 names that are either fashionable again today or that I think deserve to be used more. If you'd like to play along too, head over to the SSA's website and pick out your Top 10 names from the 1950 chart and post them in the comment section below! This happens to be my grandmother's middle name so I tend to like it. It seems as though I'm not alone in that since it is on its way up the charts! It ranked very well from 1880 through the 1960s but declined a bit in usage after that. In the past 5 years or so, Alice has become fashionable again. It ranked at #107 in 2013 and I think it'll break back into the Top 100 soon. This lovely vintage choice was once a Top 20 name in the 1880s and 1890s. By the 1950s it was heading down the charts. It wasn't until the 2000s that parents began to find this name stylish again. Clara ranked at #131 in 2013. I think it'll continue to gain popularity in the near future! This spunky, vintage name seems to be a new favorite lately. It ranked in the Top 100 for years in the distant past, but most recently, it has spent time outside the Top 1000, only returning in 1998. Now in 2013, it's inching its way toward the Top 100 again with a ranking of #157. It seems posed to continue climbing higher and higher! This is another name that is making quite the splash! In just 6 years, this name has gone from ranking beyond the Top 1000 to reaching #338 in 2013. That's impressive since it hadn't been in the Top 1000 at all since 1965. This is one to keep an eye on! If you're familiar with chart movements, you might have heard that Sadie made quite the impressive leap this year. It ranked down at #458 in 1950 and fell out of the Top 1000 for a while in the 60s and 70s. In the past couple decades, though, Sadie has become a favorite. It jumped from #119 in 2012 to #50 in 2013. I think it could be headed for the Top 10 soon! This is a name that I'm excited to see used. It was very popular from the 1880s through the 1930s but began declining in usage. By 1950, it was down to #547. It dropped out of the Top 1000 in 1965 and stayed out until 2013! It now ranks at #707 and I'd be thrilled to see it gain even more popularity! It's one of my new favorites. My great grandmother's name has always had decent usage but it has gradually declined over the years until the 2000s started and parents started to fall in love with it again. A lovely, vintage name that is now fashionable again, Leila ranked at #215 in 2013. I'd like to see it continue to inch its way up the chart! This biblical moniker belonged to a woman who could be described as "a dangerous temptress" who caused Samson's downfall. Despite this, Delilah's popularity as a name has boomed lately! Having never been popular before, it has been experiencing quite a bit of usage since the mid-2000s. It has climbed its way up to #135 in 2013 and will probably keep going! Would you use it? I can't help but love this name lately. Many parents seem to agree but they're using variants like Adelyn a little bit more. This sweet name did well around 1918 but quickly declined in usage. In 1950 it ranked down at #823. In the late 1990s, parents rediscovered it and it has climbed straight up the charts again. It has reached #232 in 2013 and will probably continue upward! This is a name to watch! It has been around in the US since 1894 and it has never been popular but I think that could change soon. It might just be the latest undiscovered gem that everyone discovers at once. It hadn't been in the Top 1000 since 1966, but as of 2013, it has popped on the chart at #944. I imagine it will be making waves toward the top soon! All of these names that I've highlighted here have the same vintage-but-fresh vibe going on. 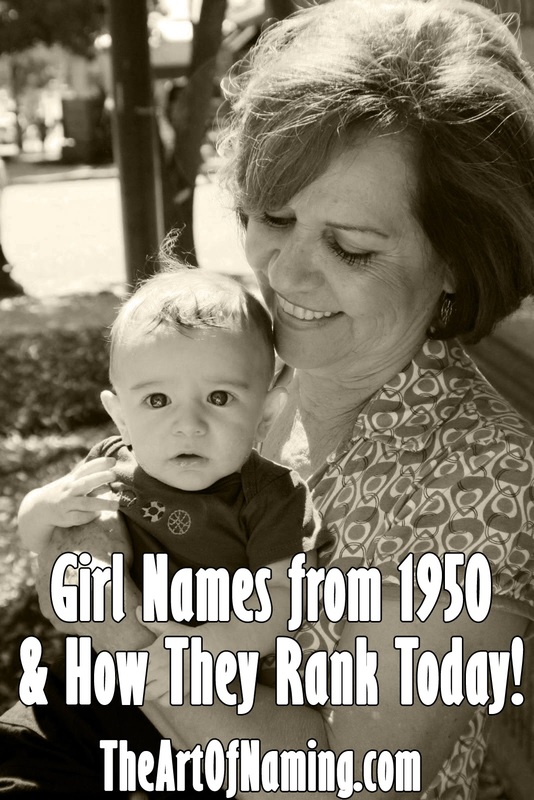 They're all old-fashioned names that have circled back around to being fashionable again! They belong to a similar "style" of names. Which of these names do you expect to be the next big thing first? Let me know your thoughts in the comments below! Let's take a look at the past! The year 1950 was smack dab in the middle of the century. Babies born that year will celebrate their 65th birthday this year. Many of them are grandparents now and may even be lending their own names to their grandchildren. As you can see, all of the boy names that were in the Top 25 in 1950 are still within the Top 600 in 2013! I found it interesting that even though some of these seem very dated, they're still hanging around and being used. Specifically, I was a little surprised to see Gary, Larry, Ronald, Donald, Dennis and Jerry still ranking as high as they do. Do you know any babies with these names? I'd wager that many of them are named after a relative but perhaps not all of them! Next, I went through the Top 1000 names of 1950 and chose a single favorite per 100 names. These are names that are either fashionable and climbing the charts today, or names that I'd like to see get more usage! If you'd like to play along, browse the chart at the SSA website and in the comment section below, post your favorite names, one per every 100 names! The nickname Theo seems to be a big draw lately. This name ranked #99 in 1950 but has declined in usage since then. In the past decade, though, it has started regaining some popularity, ranking at #170 in 2013. This is one of my favorite classic names but I tend to love it more in the middle name spot! My grandfather's middle name is Wesley so I always thought of it as an old man name. Now that I'm older, I see the charm it has. I'd like to see this one used a bit more today. It ranked at #165 in 1950 and is actually doing even better than that today, ranking at #139 in 2013. I haven't been able to pinpoint why I love this handsome, classic name so much, but modern parents don't seem to feel the same. While it ranked at #287 in 1950, it isn't even on the charts today! It ranked #1192 in 2013. I find it much more handsome than Edward. Edmund would be my Eddy of choice. I'd like to see it get more love! You may think me a bit nutty for this one, but there's something appealing about Woodrow. Perhaps it's just Toy Story and Cheers nostalgia because of the nickname Woody. This name spiked majorly around 1918 because of President Wilson, but it's been off the charts since then. In 2013, it ranked way down at #3314. I doubt it'll ever come back, but I like it anyway. It is no secret that this name is zooming up the charts today. Overnight, everyone and their grandmother seemed to suddenly love the name August. It was big in 1915 but fell mostly out of sight since then. It ranked at #468 in 1950 but fell even lower than that afterward. It wasn't until recently that it's climbed again. Now in 2013 it is up to #319 and I imagine it'll keep on going! Parents seem to love surname names these days. A new trend of names ending with -et is growing for both genders, too. Bennett ranked down at #588 in 1950 but it has been in an upward trajectory since the 70s. It is up to #194 in 2013 and will probably continue gaining popularity. This is another surnamey, occupational name that is rising quickly today. Fletcher seems to be a new favorite lately. It ranked at #627 in 1950 but it nosedived off the charts thereafter. Only recently have people rediscovered it. It's now up to #790 in 2013 and has the potential to be the next big thing soon. This is a love of mine. It seems to be a bit polarizing though. Some think it isn't usable today and some really like it. It ranked pretty low in 1950 and has only gone lower. It hasn't ranked in the Top 1000 since 1968! I think it deserves a little better than a ranking of #1482 in 2013 but maybe that's just me. Like Theo, Leo is becoming a go-to nickname. Leonardo ranked down at #847 in 1950 but it has actually been climbing the charts since then. DiCaprio gave it a boost after 1997 and today it ranks at #131 in 2013. I don't see it leaping up the chart but it'll definitely keep inching its way toward the top. Jarvis is a cool choice. It feels old but new at the same time. And that stylish V doesn't hurt! A cool namesake is that of Iron Man's advanced computerized helper J.A.R.V.I.S which stands for "Just A Rather Very Intelligent System". The name Jarvis ranked way down at #967 in 1950, spiked in 1989 and has declined in usage again today. It is down at #1238 in 2013 but I think it deserves more love. What do you think of my Top 10 picks from 1950? What would you have chosen? Share your thoughts in the comment section below! Thanks for reading! Get to Know! : Anna from "Waltzing More Than Matilda"
Since Australia Day is being celebrated on January 26th, I thought we would take a moment to learn more about Australia's best baby-name blogger Anna from the blog "Waltzing More Than Matilda." If you aren't Australian, don't worry, she explains exactly what the title of her blog really means. Anna is a wonderful blogger with great insight into names. She always has interesting and informative articles complete with opinion polls. 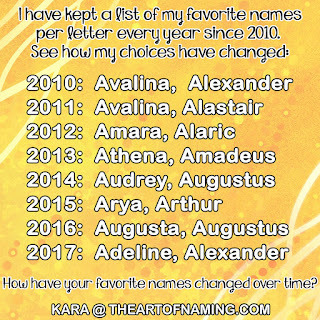 If you enjoy voting for your favorite names, Anna provides plenty of opportunities for that on her blog! She often shares names from local birth announcements and she also keeps up with celebrity baby news from Australian stars and footballers. Read below to learn more about Anna, her favorite names and her thoughts about the differences between names in Australia and names here in the US. What are your first and middle names? Do you like your name, or would you ever want to change it? When I was younger, my biggest problem with my name is that the names Anne and Mary are traditional in my family. Being an Anna whose mum was Anne, and sister was Mariana, with a cousin named Anne-Marie, second-cousins named Annette and Anita, and a Great-Aunt Annie, sometimes it felt like my name had just been chosen to be part of a pack. But now I'm older, I appreciate being part of a family tradition a lot more. My middle name has already been changed; I chose it myself when I was twelve, with my parents' encouragement (they didn't like the middle name they picked for me). If you had to change your name, what would you choose? My preference would be for Alice – simple, sweet, and enough like Anna to not be a hassle. Unfortunately, my husband has a traumatic association with the name, so I couldn't do it. Every other name that seems suitable either clashes with my surname or a family member's name, or is the name of someone I know well, so it would seem like weird creepy “name stealing”. I guess I'm not going to change my name any time soon. When did you first become interested in names? I think almost as soon as I understood what a name was, I was fascinated, and names had a very powerful effect on me. My interest was surely given impetus when my parents allowed me to help name my younger brother, which I have written about. Our family dictionary had a section on the meanings of common names at the back, and I remember getting terrifically excited to find that names had meanings. From the age of around seven, I read that dictionary section until it practically fell to pieces. Why did you begin a blog? I loved reading name sites and name blogs, but wished I could find one from an Australian perspective. Eventually I realized this mythical Australian name blog was never going to materialize, and if I wanted to read it, I would have to write it myself. What do you try to accomplish with your blog? I try to give full and accurate information on featured names, to the best of my ability, and to do my own research. I try not to sugarcoat names, and to point out any potential problems attached to them, even if I don't think the issues are a big deal. I always swore I would never be a “real estate agent” type name blogger that sold people names that I thought were great, but I'm afraid I have got a bit too enthusiastic in some cases and foisted them on people as if I was pushing door-to-door mobile data plans. So I haven't always lived up to my ideals. Where can we find your sites? As well as waltzingmorethanmatilda.com, you can also find me on Facebook and Twitter. What is the significance of your blog's title? "Waltzing Matilda" is Australia's national song, rather like an unofficial national anthem, and an immediate signifier of Australian-ness. The title of the song is a slang term: to "go waltzing matilda" means to go for a long walk carrying your belongings. In the same way, I planned to meander my way through the landscape of Australian names, accompanied by my own cultural "baggage". to provide more than the basics, to make a big effort ("They will be putting on a major event, it will be more than Waltzing Matilda"). to provide something other than what might have been expected, a possible surprise - not always a good one! ("If you keep behaving like that, I'll give you more than Waltzing Matilda to think about"). to indicate that something questionable is taking place ("I think he had packed a bit more than Waltzing Matilda for the trip"). Likewise, I planned to cover more than the standard or stereotypical Australian names, but with a certain amount of ambiguity as to what that might mean. What are some of the biggest differences in naming styles between Australia and the US? There aren't massive differences, but we tend to be fonder of British-style names, especially Scottish and Irish ones. Hamish and Maeve are more popular here than in the US, for example, and we're maybe a bit more likely to choose a nickname as the full name. The trend for “boys names on girls” isn't as pronounced here, although definitely gaining steam. And we don't have a big Hispanic population, so Spanish names aren't nearly as common here (we tend more towards Italian ones). Can you think of any names that are popular in Australia but less common in the US? Are there any popular American names that you'd like to see used more often in Australia? Camden for boys – it's quite rare here, yet Camden is a rather nice semi-rural area in Australia, and it would make a great alternative to Cameron or Campbell. And Nora for girls: it's almost unheard of here, yet it's so hip and on trend. Favorite girl names in US Top 1000? Favorite girl names on Australia's Top 100? Favorite boy names in US Top 1000? Favorite boy names on Australia's Top 100? How would you describe your naming style? I've come to realize that deep down I prefer sensible, wholesome names for girls, and something slightly more romantic and flamboyant for boys. I tend to like girl's names to be gender-specific (I'm often not even that keen on girl's names based on male ones), but don't mind unisex names on boys. As a result, I've found it relatively easy to get my husband to agree to my ideas on girl's names, and very difficult indeed to reach consensus on boy's names. If we ever have a boy, we have agreed to choose from classic, retro, and family names to avoid arguments. Which names did you choose for your children? How did you make the decision? Elizabeth and Rosemary – they both have family names in the middle. Elizabeth was something of a compromise choice between my husband and me (we both had a “favourite” name that the other vetoed), but we ended up mutually loving it. My husband picked the name Rosemary, and almost at once I thought it was perfect too. If you were suddenly adding boy/girl twins to your family, what might you name them? If we were being sensible, I think they would be named something like George and Adelaide (two names we've managed to agree on that sound quite nice together), but we might go a bit mad with the excitement and choose our “guilty pleasure names”, so they would be Harold (nicknamed Harry) and Lavender. Do you have any naming pet peeves? My perennial complaint – not enough name data in Australia! Are there any current trends that you enjoy or dislike? Favourite current trend would be for retro and vintage names, and I like that parents are being more adventurous now (also a throwback to times past, I believe). A modern trend I'm not getting on board with is names created from initials, like Emjay or even just MJ. Nothing wrong with it, but with so many names in the world, it puzzles me why you would need to just pick initials. 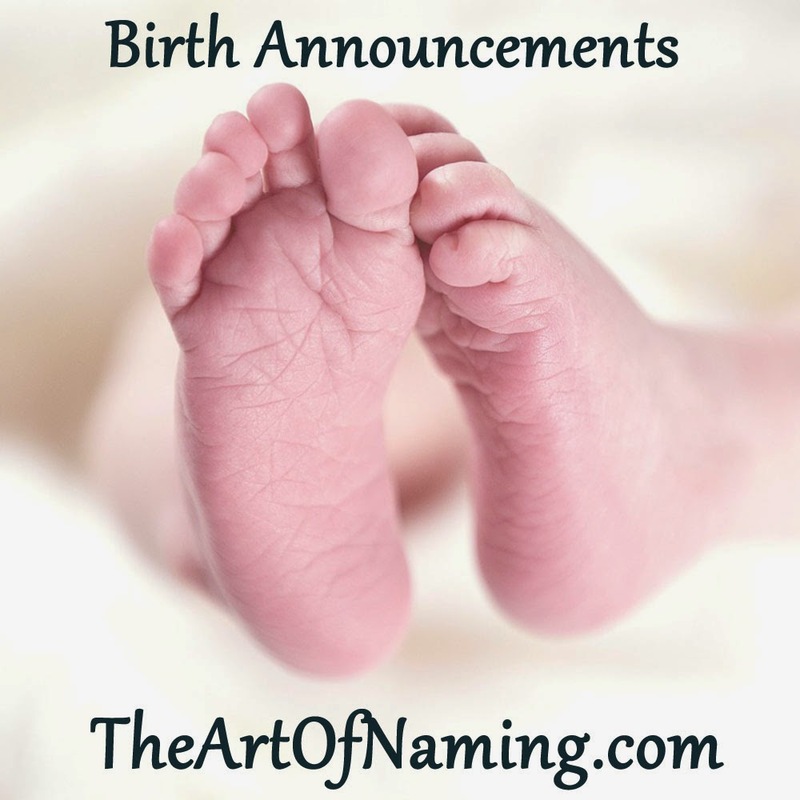 What advice would you give to expecting parents who are trying to find the perfect name? Probably to stop searching for the perfect name. Often the name that seems perfect on paper isn't really right for you, and you might end up crossing off an awesome name you love because it breaks some “rule” you made up. I want to thank Anna for graciously allowing me to interview her. Take a look at my interview on her website from August 2014! Be sure to show Anna some love by visiting her blog and social media pages! Thanks for reading! Here are some real names from some real babies found on recent hospital birth announcements in the US. Which of these do you like best? Baby name websites have thousands of names in their databases. This can cause headaches for expecting parents to browse through. How do you know which will be the perfect name for your little one? How can you sift through the unusual names from foreign cultures that you've never even heard of and don't know how to pronounce? After all, you just want a familiar, traditional name that will work well on a baby today. 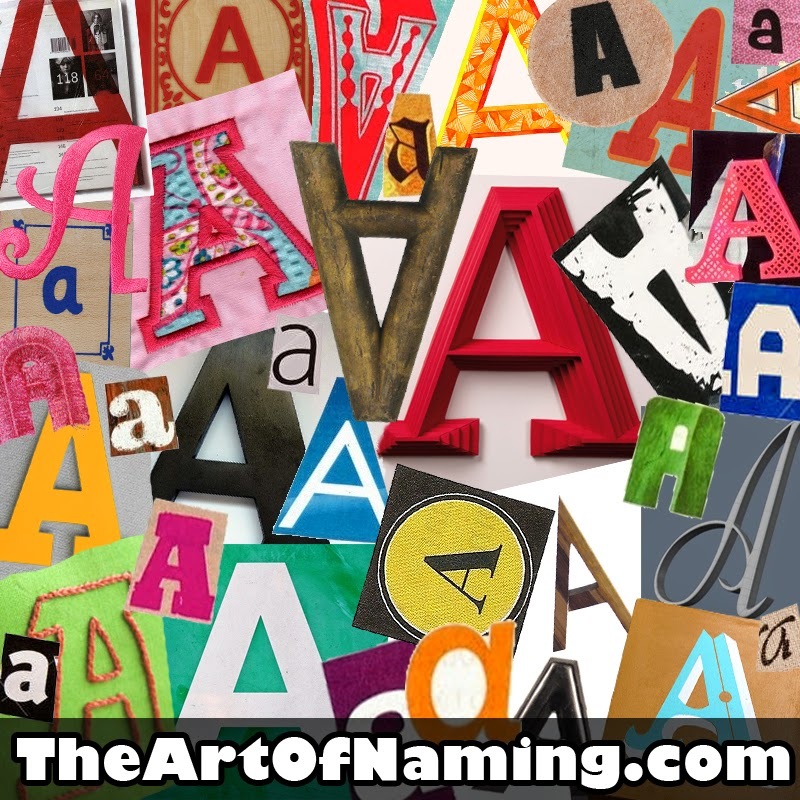 The following list contains fifty of the best names that start with the letter A, twenty-five names per gender. The goal was to include something for nearly everyone. Are there any names on the list that you don't think deserve to be on it? Or a name that's missing and should have a spot? If you had to remove one from each list, what would you replace it with? Share your thoughts in the comments below! There are so many lovely 4+ syllable names for girls; narrowing it down to one was difficult but I decided on beautiful Seraphina. 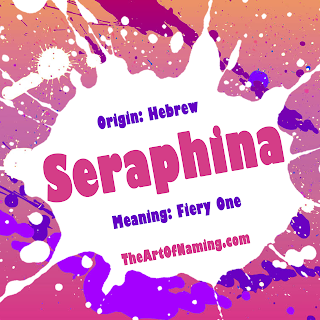 Seraphina is the feminine form of the Late Latin male name Seraphinus. This name comes from the biblical, Hebrew word seraphim meaning "fiery ones" and referring to an order of angels that had six wings each. The Seraphim were described by the prophet Isaiah in the bible. Seraphina was also the name of a 13th century saint from Italy who was known for making clothing for the poor. As a name, Seraphina was never really favored in the past. However, it is starting to take off as an usual but pretty name. Actors Ben Affleck and Jennifer Garner named their second daughter Seraphina Rose Elizabeth Affleck in 2009 which put the name on people's radars more, but yet it still remains mostly unused. The celebrity endorsement bumped Seraphina from having only 50 births in 2008 to having 88 in 2009 and 107 in 2010. However, it has still only reached as high as 168 births in 2013 for a ranking of #1373. It may not popular, but that isn't a bad thing. Since it still lingers below the Top 1000 chart, it is actually quite a beautiful and rare gem, which makes it a great, unique name. Sister-name Serafina (with an F) has surprisingly had more usage! Serafina first appeared on American babies in 1901 whereas Seraphina didn't pop up until 1981. Serafina had 117 births in 2013 ranking it at #1751. The spellings Saraphina (18 births) and Sarafina (25 births) are even less popular, but still viable options if you want Sara as a nickname. Other possible nicknames could include Phina/Fina, Sera, Fifi, and Sephy. Why do you think this name is so unheard of? Do parents shy away from the association with angels? Putting that aside, Seraphina sounds and looks so beautiful and elegant, it's a wonder it hasn't caught on yet. Perhaps it makes a better middle name and has more usage in that spot. Any thoughts? I think Seraphina and Evangeline would be beautiful for sisters since both have a nod toward a biblical association. What do you think? Perfect or too much? In the past, I wrote an article about Elizabeth and her consistent popularity since 1880: she has always ranked within the Top 30 as a first name. As a middle name, she's also a popular choice because of how extremely well Elizabeth flows with most first names. I listed four specific reasons why Elizabeth has remained so popular and works so well with other names. I also listed other 4 syllable names that might also work well as a middle name. 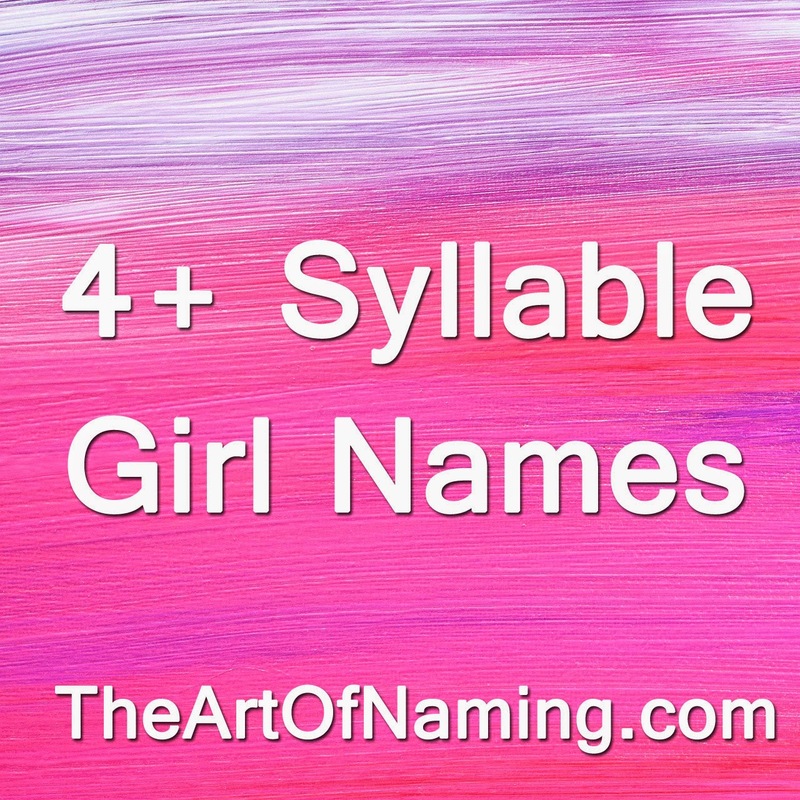 If none of those strike your fancy, you're sure to find a great selection in the following list of 4+ syllable girl names. Which of these are your favorite? Share your thoughts in the comment section below! Whew! That's quite a list! If you're looking for the complete opposite, short names, I can help with that! Here is a list of One-Syllable Girl Names and also Four Letter Girl Names. Don't forget to check out last week's list of 4+ Syllable Boy Names too! After looking at all of the 4+ syllable boy names available, I wanted to pick one that was legitimately 4 syllables on its own as opposed to a name that earned 4 syllables by adding an -o to the end of a name that is usually 3-syllables. With this criteria, it was actually rather tough to find a good one that hasn't already been featured. I settled on the biblical Jeremiah. 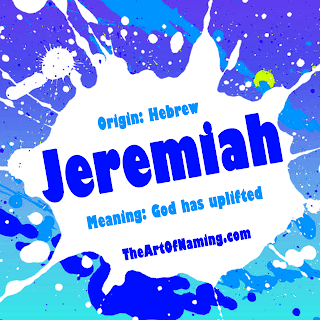 Jeremiah comes from the Hebrew name יִרְמְיָהוּ (Yirmiyahu) meaning "Yahweh has uplifted". In the bible, he was one of the major prophets in the Old Testament who wrote the Book of Jeremiah as well as the Book of Lamentations. He lived in the 6th century BC during the time of the Babylonian destruction of Jerusalem. In England, the Protestant Reformation brought about the usage of a lot of names that were later carried to Colonial America with the pilgrims. Jeremiah was one of those names. However, the shorter variation Jeremy was sometimes used since the 13th century in England. Overall, Jeremy has had much more usage in the US than Jeremiah, but currently, their roles have swapped. Jeremiah has climbed the charts to #58 in 2013 while Jeremy's popularity of the 1970s-1980s has declined. Jeremy ranked at #159 in 2013 whereas it once ranked as high as #14 in 1976. Jeremiah had a small peak of popularity in the late 70s during Jeremy's heyday but it is currently seeing its highest numbers ever, even though it has been in solid usage since 1880. Possible nicknames could include Jere/Jer, Jerry, Jem, Jeremy, Miah. What middle names would you pair with Jeremiah? Share your thoughts in the comments below!